DSN brings you sports content either before its viral, or during its tipping point. With an excellent team of content experts and influencers, we help you integrate your message with our community. Boasting over 2MM visitors, DSN can provide tailored advertising solutions to a highly sought after sports vertical. We are always looking for passionate sports bloggers to join our network. Whether you have your own blog and want to take advantage of our advertising network and social media marketing expertise, or whether you want to start a brand new 'Doctored Sports' blog for a sport we don't currently cover, or lastly if you want to do some freelance blogging for one of our existing sites, we are happy to have the discussion. We offer advertising revenue splits for the blogs that join the network, and provide access to very high paying CPM networks, currently all of the DSN sites are part of the Complex Media Network, and have video syndication opportunities with Blinkx.com. To learn more about how you can make money by joining DSN email us at admin@thedoctoredsports.com. 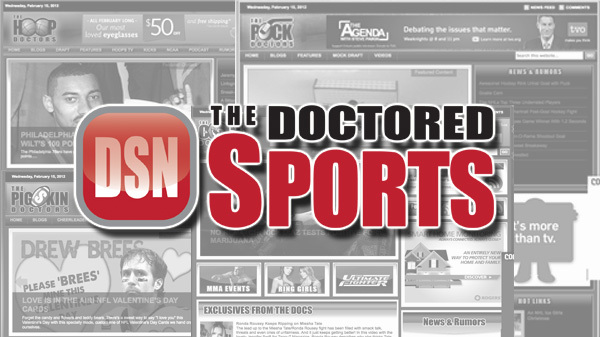 DSN is a sports blog network targeted toward any fan of professional or amateur sports. Our reader demographic is heavily concentrated in the male, aged 18-35, category. The Network sites are rapidly growing and currently can accomodate your campaigns up to a volume of 5 million monthly views per unit. If you feel our network sites would be a good fit for your next campaign feel free to contact us (admin@thedoctoredsports.com) at your convenience. © 2010 The Doctored Sports Network. All Right Reserved.